We’re continuing Jay Johnson’s City Mapping article with the third and final part. Little details add a great deal to a map. Look at these two images. The first is with trees and pathways in the courtyards. The second is without them. How much difference do these details make in your opinion? In my opinion, they make a big difference. Another detail you can work on is your shadows. I adjusted the shadow settings on my buildings so they intrude more into the streets. The places where the streets are covered in shadow creates a sense of danger and mystery, don’t you think. Think about your city’s history and include details that suggest a city that has evolved. Your city should have a nucleus (the original settlement) from which it expanded. Consider how this expansion took place and the different phases through which it occurred. Think about how your city has grown. If there were old walls, roads that ran beside them most likely now mark where they once were. Maybe sections of these walls still stand or roads pass beneath old gates that are located far from what is now the city’s perimeter. What other changes may have occurred as your city grew? Let’s take a minute to talk about some more advanced techniques I have used. Some that require using other programs in conjunction with CC3+ and its add-ons. CC3+ is a very powerful and versatile application. You can create some amazing maps using only it and its add-ons. But eventually you may run into a situation where the supplied resources just don’t allow you to accomplish what you desire. Using other programs alongside CC3+ only enhances its power and versatility. You can import your own PNG images and convert them to symbols. These can be images from other sources or ones you create or modify yourself. You can also import bitmaps and use them as fills and backgrounds. On my map of Melekhir (which you have seen many images from in this article) I created my own background which I imported into CC3+. I have also created several of my own symbols. In the previous images, the barrier walls around the canals and the statue in the pool south of the market square are symbols I created. This may sound intimidating to you. I know it did to me at first, but it is something you can ease into as I did. Remy Monsen does a good job of covering creating and importing symbols and bitmaps in the Tome of Ultimate Mapping, so I am not going to get into the details of creating and importing them here. What I am going to talk about is some simple things you can do to help in your mapping and get your feet wet, so to speak. My first step in learning how to make my own symbols was to make some minor modifications to CC3+ symbols to adapt them to my needs. This did a couple things for me. First, it provided a symbol that met the needs for my application. Second, it allowed me to learn and get comfortable with the software I was using to modify the symbols and the process of importing them into CC3+. I was wading in the shallows, developing the skills and confidence I would need to eventually swim with the sharks in the deep waters (I actually only swim with small sharks and I have been assured they don’t bite). There are many different software applications that you can use to modify and create raster images (raster images are what our symbols and bitmaps are) and plenty of tutorials online to teach you how to use them. My personal go-to application is Autodesk’s SketchBook. It is a powerful drawing program that was once a pay-to-use product, but has now been made available as a free product by its developer. One very easy modification to a symbol that can prove very useful is to simply cut off a section to make a new symbol. 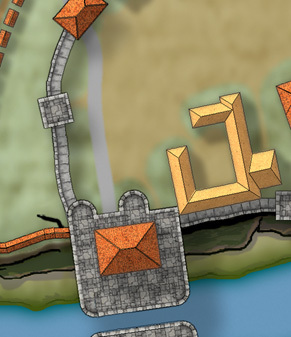 When placing the walls around the garrison, the wall sections I was using (from the Jonathan Roberts’ Cities style which is available in the Cartographer’s Annual Volume 6) could not make the tight bends I required. To fix this, I clipped off a piece of the wall section in SketchBook and saved it as a PNG to be imported into CC3+ as a new symbol. In the image above, you can see how I was able to make a much curvier wall than I could have with the unaltered symbol. The gate complex at the bottom of this image was made by assembling pieces I cut from the square and round towers and piecing them together (kind of like working with Legos®). After I pieced it together I made some minor touchups to hide the splicing lines. Projects like these are great ways to develop your skills and push your limits. Another advanced technique is what I call post-processing. This involves taking your finished map into another program (like Photoshop, GIMP, SketchBook, etc.) and adding additional effects or details. One neat trick is to add a parchment layer (or layers) and blend it with your map to give a more muted, aged look. You can find tutorials online that explain this technique in greater detail. Don’t forget the power of Sheet Effects. They are a powerful feature of CC3+. Sure, you probably already have played around with them some, but there are just so many things you can do with them. I am still learning all the cool things they are capable of. 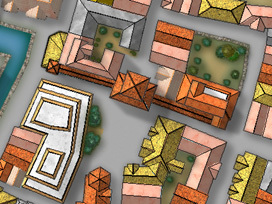 To find out more about Sheet Effects see The Tome of Ultimate Mapping by Remy Monsen or check out some of the amazing (yes “amazing” is totally appropriate here) maps and tutorials made by CC3+ users on the ProFantasy Forum. As we come to the end of our conversation, let me mention a few additional resources. One is the Cartographer’s Annuals available from ProFantasy. Take some time to check out what is available in each album. I am sure you will find some you absolutely cannot do without. Another great resource is the online communities dedicated to map-making. I cannot stress enough how much value there is to having another set of eyes look at your work. They will catch things you will never catch, and tapping in to someone else’s knowledge and experience is a (to use a military term) force multiplier. The first community I would suggest becoming part of is the ProFantasy Forum. There is a wealth of knowledge there concerning the use of CC3+ and some friendly people eager to give you a hand. Another great community to become part of is the Cartographers Guild. Their membership includes people who create some truly beautiful maps using a wide assortment of methods. 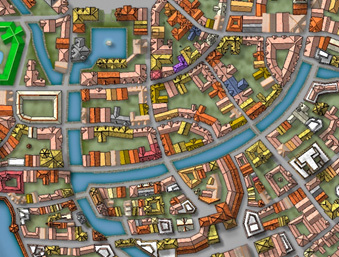 Even though many of the maps are created using different methods, you can still learn a great deal from them to apply to the maps you create using CC3+. Remember, we are all cartographers regardless of the means we use to pursue our cartography. I have learned a great deal that has improved my maps made with CC3+ from mapmakers who use Photoshop, or pen and ink, or other means and have never used CC3+. Map-making is map-making and it transcends the tools we use. Master your tools and master your craft and you will make some masterful maps. 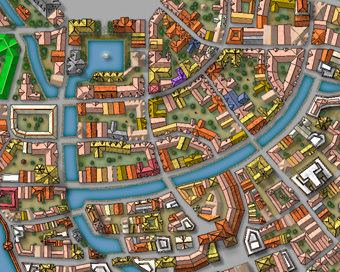 Download the complete Mapping Cities article as a pdf. Jay Johnson is an aspiring author working on an epic fantasy series. He has always loved maps and, like many of us, was introduced to fantasy cartography through the works of J. R. R. Tolkien. His map-making has become an integral part of his writing process — a process he says often seems more like discovery than creation.